Hyacinth macaws (Anodorhynchus hyacinthinus), also known occasionally as blue macaws, are large South American birds whose status is listed as endangered due to problematic factors, such as unlawful hunting and habitat minimization. Not only are hyacinth macaws the biggest macaws, they're the biggest parrots around, too. Despite their falling numbers, hyacinth macaws are equipped with a few handy survival adaptations that help keep them going as a group. Hyacinth macaws are sizable parrots that, when mature, usually reach around 39 inches in length. Adult hyacinth macaws also typically weigh somewhere between 3 and 3.5 pounds. Their habitat preferences include grassy plains, woodlands, palm groves and marshes. Many of these bright blue birds also live close to rivers. The hyacinth macaw menu typically consists of fruits, seeds, snails and palm nuts. It's not rare for these macaws to make big journeys to look for sustenance. Hyacinth macaws frequently live to around half a century in age, both in captivity and in nature. Hyacinth macaws possess impressive dark beaks that are notably tough and sturdy, the mightiest within the avian realm. These big beaks are masterful when it comes to getting persistent nut shells to break apart. 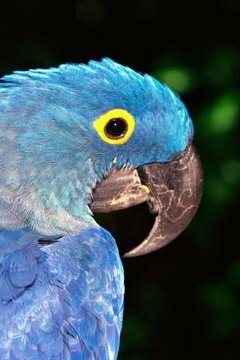 If a hyacinth macaw is intent on munching on a coconut, his beak can work its magic. Strangely enough, these birds, as with other types of macaws, sometimes even use their beaks as additional feet, since they help them maintain their clutches on trees. Their beaks help them scale things more easily. Their deep gray legs also are beneficial for survival. Their robust, markedly short limbs allow them to suspend their bodies easily off of things -- convenient for spending lots of time up in trees. They can even dangle their bodies toward one side. Hyacinth macaws are some of the most notable bird brainiacs around. Many of these parrots even have the ability to use tools. Captive hyacinth macaws have even unlocked their aviaries, cheekily. Although many adaptations are characteristic specifically of hyacinth macaws, these guys share a few adaptations with other macaws, too. Macaws on the whole have extremely strong eyesight that assists them in practically everything they do, whether it pertains to searching for meals or flying. Macaws also are particularly swift at flying, sometimes whizzing around at a maximum of 35 mph.